Since its relaunch a couple of years back, Brave and the Bold has gone through a series of subtle shifts in concept. Always a team-up book at heart, the permanence, length and importance of each story have changed shape somewhat routinely with the introduction of each successive writer. In its latest incarnation, the book serves as an addendum, expanding upon and rounding out characters and relationships that don't get a lot of time under the spotlight in DC's regular ongoing books. While the tone is generally playful and light, sometimes it will surprise us with an unexpected dash of emotion, revisiting chapters in certain characters' lives that aren't entirely rosy. As you've probably gathered, this would be one of those issues. 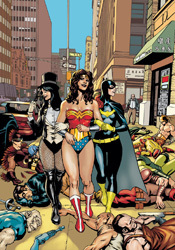 The majority of the tale is optimistic enough, a rare night on the town for the intimidating trio of Wonder Woman, Zatanna and Barbara Gordon while the latter was still donning a cape and cowl for routine evening patrols of the city. The three hit the clubs and enjoy a little personal interaction, nothing too weighty or profound at first glance. In fact, as the page count began to swell, I wondered if this chapter would offer anything of consequence or if it was just here to provide a month's worth of filler. As with many of my own late nights out, though, around 3AM in a booth at Waffle House the conversation suddenly takes a turn for the serious. J. Michael Straczynski doesn't quite spell it out for you right away, but when Diana starts talking about the inevitability of fate and the power of overcoming its challenges, the ultimate direction of this month's story quickly becomes obvious. It transforms a formerly fluffy tale without much weight into something that's a little bit deeper, more insightful and meaningful. Cliff Chiang isn't the permanent artist for Brave and the Bold (regular penciler Jesus Saiz still provides the cover) but he makes a good enough showing that I don't think it'll be long before DC fits him into an ongoing gig somewhere. His restrained style, a mix of the Kubert brothers and Frank Cho, was a good choice for an issue that's focused on three strong female leads. Chiang gives them each a willful, confident air without neglecting their looks. The trio may be gorgeous, but they're also not ditzy or meek – which is something that's often much easier said than done in this industry. My one main complaint was in how difficult it was to tell Zatanna from Diana in their civvies, but that's a mystery that's fairly easily solved once they open up with a little dialog. Chiang's work is smooth, efficient and appropriate, a great fit for Straczynski's plans. This isn't an issue that's going to radically alter anyone's perceptions of the characters; who they are and what they've been through. At best it's a companion piece, and a fleeting one at that. Its connection to one of DC's most shocking moments is sparse, but I think I prefer it that way. Straczynski isn't meddling with a story we already admire, he's just showing it from another angle. It's not essential reading by any means, but fans of any of these characters will want to give it a long look. A bite-sized success, short but sweet. Borrow it.